The X-Files is an American entertainment franchise created by screenwriter Chris Carter that portrays the fictional investigations of two FBI agents played by David Duchovny and Gillian Anderson. Together their characters, Fox Mulder and Dana Skully take on cases laced with the paranormal. Most X-Files shows are episodic, but woven into the series is a long term story arc that draws the agents ever closer to exposing a clandestine shadow government that is collaborating with extraterrestrials. The television series first aired in September 1993 and ended in May 2002. The show was primarily set in present day USA ( as of the time of production ), but the first five seasons were filmed in and around Vancouver British Columbia, Canada. 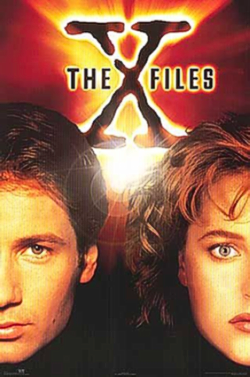 The television series became very successful, breaking the way for the 1998 feature film The X-Files - Fight The Future.